After a long period of great expectation – the band had been carefully planning this album for us during years, Acid Mothers Temple finally debuts on Essence Music with two releases (see also 41st Century Splendid Man Returns)! And what this powerful quartet delivers on Ominous From The Cosmic Inferno is a nothing short but amazing. A super wild, punishingly dark slab of experimental psychedelic hell where fuzz blasted, ultra riffing and hypnotic speed guru guitar chaos – courtesy of Mr. Kawabata Makoto – meet early Amon Düül-influenced druggy, acoustic, mantric folk experimentalisms and eastern drones from below. 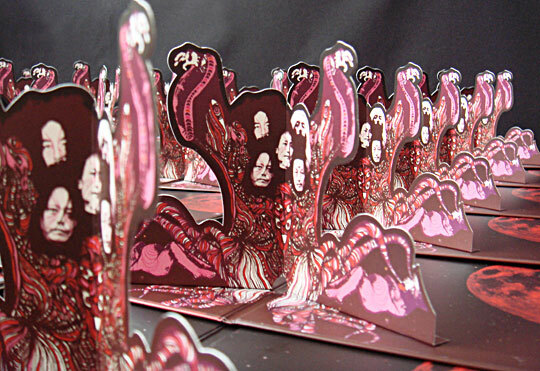 The scent of sulphur fills the air and brings on the Japanese psychedelic inferno! 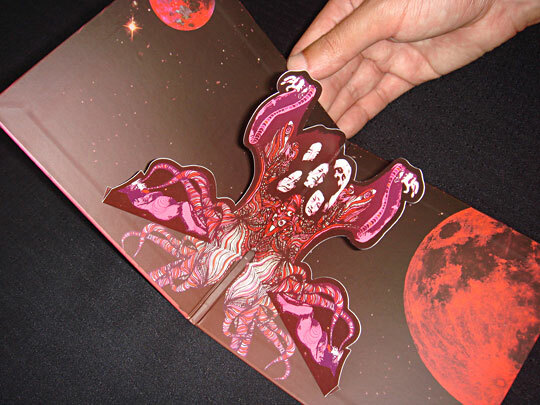 Presented in our deluxe, sturdy gatefold mini-LP packaging featuring cosmic artwork by Jason Killinger and including a striking pop-up!